The cows came home at the La Crosse Area Synod Assembly. 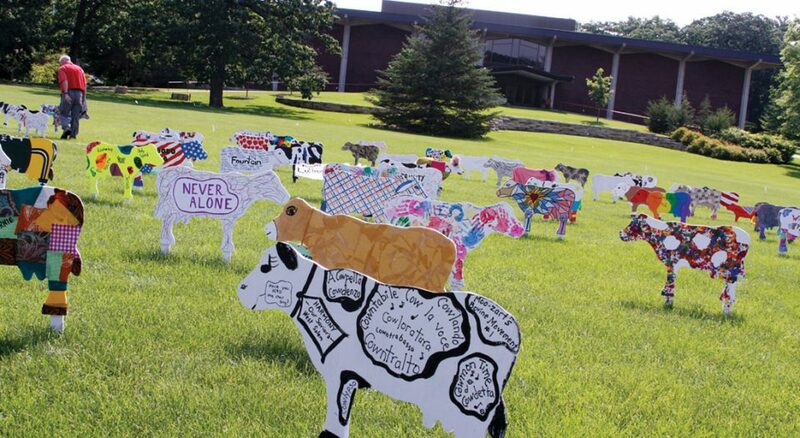 With pledges of $500 per cow, the 142 wooden cows raised $71,000 for ELCA World Hunger. Volunteers wearing their “God’s work. 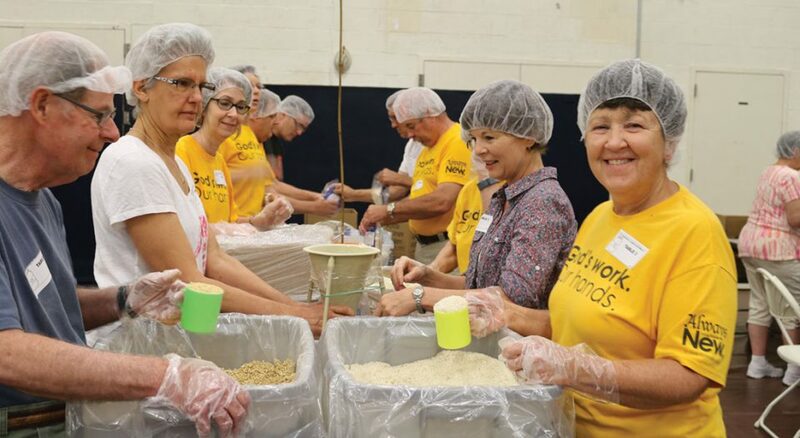 Our hands.” T-shirts help pack 415,876 meals for the Central PA Food Bank during the Lower Susquehanna Synod Assembly. 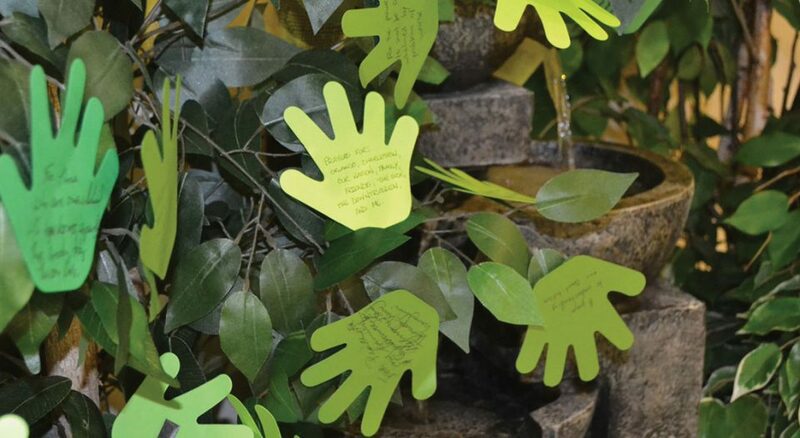 Meeting under the theme “For the Healing of the World,” participants at the Metropolitan Washington, D.C., Synod Assembly wrote prayers on hand cutouts and placed them on a tree display during opening worship. At closing, they took a hand to add the petition to their prayers. 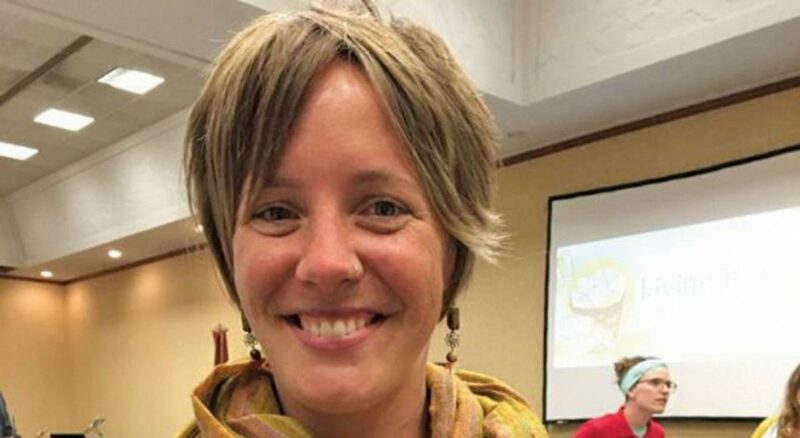 At the Western North Dakota Synod Assembly, Taryn Montgomery received the ELCA’s Dr. Richard Lee Peterman Award for her efforts in modeling and teaching holistic stewardship. In the past five years, her congregation, Bread of Life Lutheran, Minot, N.D., has grown their mission support by more than 2,000 percent. Newly elected bishops: William J. Gohl Jr., Delaware-Maryland Synod (left); H. Jeffrey Clements, Northern Illinois Synod; Barbara Jeanne Collins, Upper Susquehanna Synod; and Paul D. Erickson, Greater Milwaukee Synod. Editor’s note: Synod communicators were asked to share a highlight from their assemblies. What made a difference to participants? What was the most important part of the assembly? Responses received by presstime are included here. Elected: William J. Gohl Jr., 42, as bishop of the Delaware-Maryland Synod, effective Sept. 1. When: June 4, on the fifth ballot, with 227 votes. Wolfgang Herz-Lane, current bishop, received 225 votes. Bio: Pastor of Epiphany Lutheran Church, Baltimore. Earned degrees from Gettysburg (Pa.) College and the Lutheran Theological Seminary at Gettysburg. Working on a doctorate at the Lutheran Theological Seminary at Philadelphia. Elected: H. Jeffrey Clements, 61, as bishop of the Northern Illinois Synod, effective Sept. 1. When: June 18 on the fifth ballot with 278 votes to 181 votes for Stacie Fidlar, pastor of St. John Lutheran Church, Rock Island, Ill.
Bio: Assistant to the bishop for the synod since 2002. Served three congregations in Illinois and one in Minnesota. Earned degrees from the University of Illinois at Chicago and Luther Northwestern Theological Seminary, St. Paul, Minn.
Replaces: Gary M. Wollersheim, who retires at the end of August. Elected: Barbara Jeanne Collins, 58, as bishop of the Upper Susquehanna Synod, effective Sept. 1. When: June 18, on the fifth ballot, with 133 votes. William Henderson, pastor of Christ Evangelical Lutheran Church, Lewisburg, Pa., received 122 votes. Bio: Assistant to the bishop/director for evangelical mission for the synod. Served Follmer and St. John Lutheran churches, Potts Grove, Pa., and as interim and supply pastor. Received degrees from Bloomsburg (Pa.) University and the Lutheran Theological Seminary at Gettysburg (Pa.). Replaces: Robert L. Driesen, who retires Aug. 31. Elected: Paul D. Erickson, 55, as bishop of the Greater Milwaukee Synod, effective Sept. 1. When: June 4 on the fifth ballot with 190 votes. Lisa Bates-Froiland, pastor of Redeemer Lutheran Church, Milwaukee, received 165 votes. Bio: Director of Agora, a ministry in St. Paul, Minn., that helps develop lay leaders for immigrant and multicultural congregations in Minnesota and South Dakota. Previously served as assistant to the bishop in the St. Paul Area Synod and congregations in West St. Paul, Minn., Milwaukee and Chicago. Earned degrees from Gustavus Adolphus, St. Peter, Minn., Lutheran School of Theology at Chicago, and Luther Seminary, St. Paul. Replaces: Jeff Barrow, who retires this summer. with more than 80 percent of ballots cast.